Can solar panels be mounted on any roof? There are close to two million solar installations in the U.S. and that figure is predicted to double by 2023. That’s a lot of roofs and ground-mounted solar panels generating electricity through the sun. One question that arises for anyone thinking about the installation of photovoltaic (PV) cells on their homes is whether the roof they have - the most common place for solar panels that need clear, unshaded areas to produce the most power - is compatible with solar panels. There are, obviously, different type of roof configurations and materials. But for the most part, they all allow for the installation of solar panels, which are designed to be easily and durable mounted to racks that attach to the roof. The first thing to know is that these panels won’t hurt your roof. 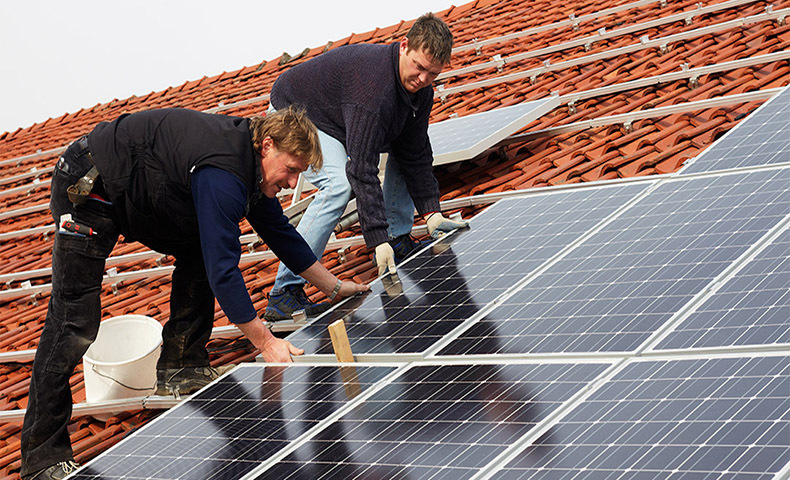 Any experienced solar installer will accommodate your needs and work with what you have. Do keep in mind that (for the most part) solar panel roof mounting brackets have to be drilled onto the roof’s rafters to comply with building codes. The Department of Energy recommends that before starting a home solar project, you evaluate the age of the roof and how long until it will need to be replaced. If you expect to replace your roof in the next few years, you may want to consider making this improvement before installing the solar. Keep in mind that home solar power systems last on the average upwards of 20 years, and making roof repairs once the solar panels are installed might mean inconvenience and additional costs later. Also, for maximum energy production, the solar panel array should be facing south or southwest with no shade from trees or other obstructions, and at a 30-degree angle. If your roof is flat, the installer will use tilt-up brackets. The most common roof types in the U.S. are composite and tile, but solar panels can also be mounted on metal, tar and grave, torch-down, wood shake, and even foam. This is perhaps the most popular roof materials and, as such, installers know how to work with it by simply drilling studs and attaching the soar panel mounting brackets where needed. The space around the brackets is later sealed and surrounded with a flashing, a metal plate used to prevent water infiltration. Standards mounts can be used for tile roof. Solar panel installers will usually remove a couple of tiles, attack the tile hook and flashing, and replace the tiles where they were. This prevents tiles braking as the installer walks on the roof. There are also special panel mounts that are integrated into a clay or Spanish tile to facilitate the installation. This roof material requires special care because the pieces can be fragile, but they are all made the same way, with layers between the rows of shakes. An installer simply gets flashing under the previous layer or underlayment to mount the bracket. For the most part, solar panels can be installed without making any holes in your roof by using mounting systems that clam onto the seams. This type of roofs are also very effective for keeping the solar panels cool and helping in energy production because the seams act as channels for air circulation. For corrugated metal roofs, the installer will have to drill holes, but will surely waterproof with sealant to prevent moisture from seeping in. Either made of concrete or rubber, attaching solar panels on these types of roof are a no-brainer. The only thing the installer has to do is install slanted metal racking to prop up the panels for maximum energy production. Most installer don’t even have to make holes on the roof; instead they use weighted racking (ballast system) that is less expensive than regular mounts. The installer should be able to give you an assessment of your roof’s condition and guarantee roof replacement and repairs. Besides the savings in your electricity bill, and the increase in value to your home, the installation of solar panels on your roof will actually protect it and extend its life. Roofs are damaged over time from exposure to weather conditions, be it rain, snow, wind or heat. The solar panels actually serve to protect the roof, acting as a barrier between it and mother nature. They also provide shade for the roof, which in turn cools the surface, and lowers the temperature inside your home, reducing the need for air conditioning.